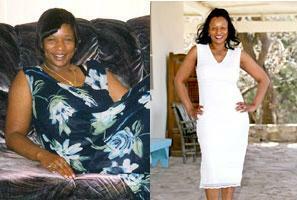 Drinking, eating high-fat foods and not exercising was a way of life for me until I gained almost 40 pounds in a year. I had a desk job where my meals consisted of large portions of takeout food. When I wasn’t working, I partied with my friends, drank too much beer and ate high-fat snack foods. I alsosmoked five to six cigarettes a day. As the pounds crept up, my self-esteem went down. Instead of doing something about my weight gain, I made excuses and bought larger clothes. When I reached a size 14, I realized I needed to do something to control my weight. I cut out high-fat foods, like cheese and cream sauces, and replaced them with yogurt, skinless chicken, bagels and salads. Frozen, low-fat entrees helped me control portion sizes. I started exercising at the local gym, where I stair climbed and weight trained. I lost 35 pounds in eight months and I felt better than before, but I didn’t feel fit. Then, one night after a workout session, the owner of my gym asked me why I didn’t look better since I was working out at the gym five nights a week. It was then I finally realized that my drinking and smoking were hindering my progress. I had to quit both if I truly wanted to be healthy. After I quit smoking and drinking, I took my fitness to the next level. My lungs and head cleared and I was able to increase my stamina and push myself further when I worked out. Giving up cigarettes and beer also boosted my self-esteem. I knew if I could give those up, I could do anything I set my mind to. Being fit and active has led me to do some physically and mentally challenging things. I completed the California AIDS Ride, an almost 600-mile bike race from San Francisco to Los Angeles. It was a great way to use my fitness achievements to help others and to challenge myself. I’ve also completed a marathon and finished in the top 30 percent. Now I feel strong and healthy and my self-esteem is great. I also have helped friends become more health-conscious. I carry around a photo of myself from when I was overweight to show those who ask me for advice that I’ve been in their place. I hope to continue a lifestyle of healthful habits and pass them on to my children. It’s wonderful to like the way you look and feel.